An informative afternoon with CHINKEE “Mr. 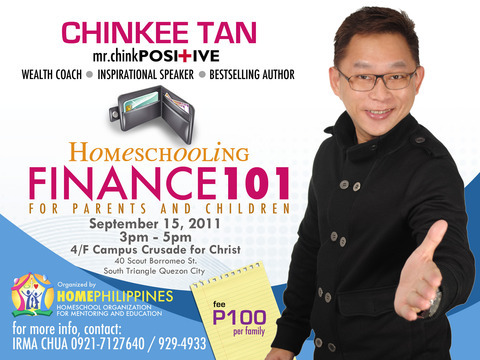 Chink-Positive” TAN as he equips homeschoolers on finance on Sept. 15, 2011, 3pm-5pm, 4/F CCC. #40 Scout Borromeo Street, South Triangle, QC. For more information, contact Irma Chua at 0921-7127640 or 929-4933.